Hardwood floors are a beautiful addition to any home. They add warmth, increase the value of your home, and bring together a room with such elegance—they also have a knack for showing every hair, speck of dirt, and paw print that comes their way! Just because they are destined for dirt, doesn’t mean they should be shied away from—use these steps to best clean your hardwood floors with ease. 1. Move the big stuff—move away any furniture, large objects, and items that may be on the surface you are beginning to clean. It is important that if you are going to do a job, you do it properly which means cleaning the whole surface, not just what you can see from your vantage point. 2. Dust the surrounding surfaces—make your job easier in the long run! Take a duster and clean ledges, lamps, shelves, and other surfaces that will inevitably land on the floor surface when cleaned. Start high and work your way down ensuring dust falls on surfaces that have yet to be cleaned. 3. Sweep—once the dusting is complete, take a soft bristled-broom and work your way from one end of the room to the other. This will remove large objects that may get caught in small vacuums or may scratch the floors’ surface if dragged about by a mop. 4. Identify your wood and finish—different types of wood and the surface-seal they have require different cleaning products and techniques. Newer floors are often sealed with polyurethane, urethane, or a polyacrylic coating which make them easy to clean as they are water and stain resistant. Older or refinished floors may be covered in varnish, lacquer, or shellac which requires gentler cleaning as they are less durable than their modern counterparts. Identification will help you choose the method and products best to use when cleaning floor surface. 5. Select the right cleaning product—it is best to select a pH-neutral water-based cleaner for generalized routine cleaning, these are gentle on your floors and their finish. For tougher grime, alkaline water-based cleaners, soaps, or baking soda will help with mess, but will dull the finish over time so only use when necessary. Water and vinegar solutions are best for cleaning hard water spots, or mineral deposits such as the salt brought in during winter. It’s always best to speak to a professional when selecting a cleaning product for your home. 6. 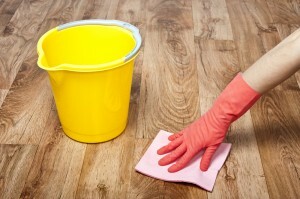 Mopping—dilute your cleaner with water, choose a clean mop, and start mopping going with the grain of the wood. Remember to change mop water when it gets dirty. Remember to mop up excess water as most floors are water resistant but do not react well to puddles left to stand. After mopping with cleaning agent, rinse floors with clean mop to remove any excess soap or product that may be left behind. 7. Drying—use a terry cloth towel to remove moisture and add an extra shine. This step is not a must, but helps give your floor the best clean you can!